While most of us know how much to tip at a restaurant (and often the amount is even printed on our receipts for us), the constantly changing nature of tipping etiquette makes it difficult to keep up. Here are some general tipping guidelines. Experts recommend that you tip 15 to 20 percent if you go to a sit-down restaurant. This means that if your meal was $20, then you should give a $3 or $4 tip. You are expected to tip well when you go to a sit-down restaurant because waiters and waitresses are typically only paid minimum wage. Therefore, the bulk of their pay comes from tips. You’ll often find that gratuity is automatically added for larger parties, so keep an eye out for this on your check. Many people do not tip when they go to a buffet-style restaurant. However, it is a good idea for you to leave a $1 or $2 tip for the person who is refilling your glasses and clearing the tables. If the service is good, then you may want to leave a couple more dollars. In the past, people never tipped at fast food restaurants. However, more restaurants are leaving out tip jars. If you want to tip at a fast food restaurant, then you can put the change from your meal purchase in the jar. 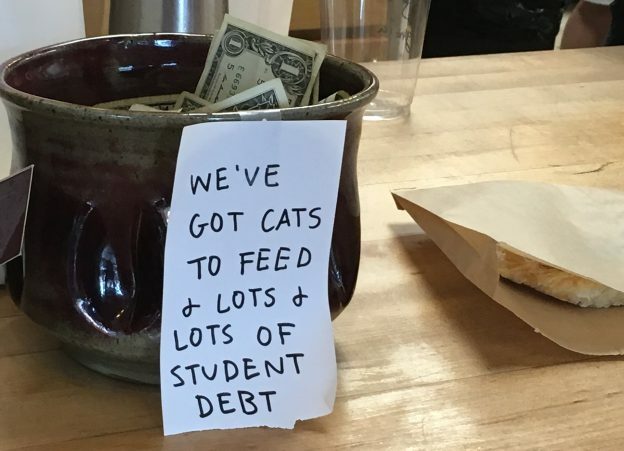 You can also put a dollar in the jar. All delivery services have their own recommended tip amount. However, most of them recommend that you tip 10 to 15 percent of the delivery cost. It is important to remember that delivery workers are paid by the hour. They also make your life more convenient by taking things straight to your door. Some individuals mistake their “delivery fee” for a tip. Note that a tip and delivery fee are not the same. While a delivery fee is typically kept by the company to cover their overhead for delivery expenses, the tip goes directly into the driver’s pocket. Even if there is a delivery fee, you should always leave a tip. You should tip your cab driver 15 to 20 percent of the fare. However, you can tip more or less depending on the type of service that you get, or how happy you were with the trip. You should also think about how long it took for the driver to pick you up before you give a tip. Thirty-one percent of people do not tip their hotel maids. However, you should tip your hotel maid because, like servers, tips make up a decent portion of their income. Furthermore, hotel maids do all the things you don’t want to think about on vacation: making the bed, putting out a fresh roll of toilet paper, etc. The type of hotel that you stay in will determine how much you need to tip. If you are staying in a high-end hotel, then you should tip $5 per night. You should tip $2 or $3 per night if you are staying in an average hotel. The standard tip recommendation is 15 to 20 percent. However, you can tip more or less depending on how satisfied you were with the service. It is important to remember that the tip will help cover the overhead cost that your massage therapist incurs from running their business. You should tip $1 or $2 for every drink that you consume. If your bartender has a tip jar, then you can also put some spare change in that jar. Bartenders work hard, making drinks for the people that sit at the bar and are ordering alcohol throughout the entire restaurant. Furthermore, mixology is an intricate and scientific skill. It deserves to be rewarded. Many people think that it is acceptable to not leave a tip if the service was bad. Unless you felt completely unattended to, you should still leave a 10 percent tip. Many restaurants divide tips among the servers, busboys, and kitchen staff, so your tip may benefit others that worked hard – even if your server was inattentive. VALET SERVICE IS ALWAYS A CHALLENGE TO FIGURE OUT. WEATHER? HOW BUSY THEY ARE? HOW MANY PARKERS THERE ARE? ANY INPUT AS LONG AS YOU’VE GONE THIS FAR? This tipping information is helpful. Could you add, newspaper deliveries, repair and other service providers in home, and other non-essentials like, garbage pickup, letter carriers. How much to tip hairdresser? A different size tip if hairdresser owns the salon?